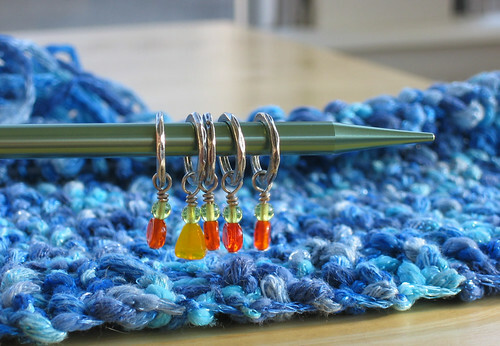 Here's my latest set of stitch markers. The colors remind me of citrus trees, my all-time favorite being the meyer lemon tree. I'm insanely jealous of people who live in a climate where they can grow citrus trees outside, or who have enough of a green thumb to keep them alive indoors. I, unfortunately, can do neither. In the background is a raglan sweater I started a year or so ago and never got very far on. The yarn is Knitpicks Vacation, which is a little awkward to work with because of its thick-and-thin texture. I'm going to buckle down and complete it this year, hopefully in time to wear this fall.